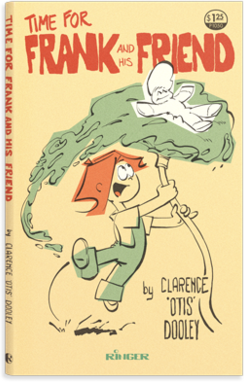 A little while back, I reviewed Finding Frank and His Friend, which reprints a recently discovered cache of previously unpublished Frank and His Friend comics. It was a wonderful book devoted to Clarence 'Otis' Dooley's most famous creation and was nominated for an Eisner. Of course, everything about the book except for that Eisner nomination is a complete fabrication. Dooley never existed, nor did Frank and His Friend. The whole book was an exploration of nostalgia by showcasing a fine example of it objectively. And the only way you could be objective about nostalgia is to look at something that never existed and you couldn't possibly have nostalgia for. Brilliant work, I thought, and exceptionally well executed. Now comes Time for Frank & His Friend. Although it was the fourth book of Frank and His Friend comics, this was the first that contained all new material, the previous books simply reprinting his newspaper strip. Curio & Co found a stash of "deadstock" copies and are now selling them alongside Finding Frank. But, again, Dooley never existed. I was really curious to see this new book. A collection showcasing "lost" comics is one thing, but a full collection of original comics is another. You've essentially got to create a whole new strip, keeping in mind the technical limitations, social mores and overall conventions of the time you're trying to replicate. In this case, the late 1970s. Plus, if the "lost" material wasn't funny or didn't really work as a comic, you could always claim that's why it was discarded. This material would have to hold up as something that could have been legitimately published and accepted by the 1979 reading public. In 1979, I was seven years old. We didn't have air conditioning, so on particularly hot summer days, I would go down into the basement and read. My mom's parents had given us an old couch of theirs at one point, and that was downstairs next to a bookcase Dad had built into the wall. Most of the books on those shelves were older; stuff he and/or Mom had gotten when they were in high school and college. Among the books were a dozen or two paperback collections of comics. Some reprint material, some new. Some newspaper strips, some unrelated to anything else. Some juvenile, some mature. Pogo, Peanuts, Andy Capp, Addams Family, Spy vs Spy, Captain Klutz... They were all at least ten years old by the time I got to them. Cracked spines, dog-eared pages, thumb prints. I think a couple of them had their covers taped back on. But I read them. Repeatedly. Some were funnier than others. Some were funnier a few years later when I started to understand the humor better. But I spent many an hour reading on that couch. The couch is long gone now. I suspect most of the books are, too. But I sat on my own couch tonight with a copy of Time for Frank & His Friend and became seven years old again. The book physically captures the essence of those old paperbacks. From the size and shape, to the design, to that red color on the paper's edges. (Why was that ever done in the first place?) The only thing that didn't feel authentic about it was that it was new and hadn't been read a thousand times over the past ten years. They really put a LOT of attention to the details on this book and it really shows. The content also "felt" right. It's not a strip I would read on its own merits today in the 21st century, but it does read very much like a comic I (and much of America) would have followed in the late 1970s. Especially some of the recurring character bits, like a particularly strong aversion to broccoli and a love/hate relationship with the idea of monsters. It's not funny in the same way Calvin & Hobbes was, but it's clearly not meant to be either. I think the Curio & Co crew did a fine job putting this together, and it works as a great companion piece to Finding Frank. Between these and the material for the Spaceman Jax animated cartoon (just as fictitious) they're creating a fascinating world very close to, but distinctly apart from, our own. "Instant memorabilia" is the phrase they used at one point; it'll be interesting to see what other ephemera they find. Old maps from an amusement park? A high school yearbook from the school that produced several minor celebrities thanks to a talented art teacher? The diary of Charles Schulz's long-lost, orphaned brother? The legal procedural documents that helped launch a lawsuit against the post office for copyright infringement? If they put as much care and attention to whatever it is as they have with with Finding Frank and now Tim for Frank, I'm sure it would make for a fascinating broader perspective on the world once inhabited by Otis Dooley. Nice post, man. The sensation of being on that couch in that basement escaping the heat on a broiling summer day in 1979 feels very real.